reach out to their target market. With Facebook Ads you are in control of your ad campaign. This valuable credit allows you to experience advertising on the largest social-networking website. Netfirms customers will be able to reach out to a new wave of customers in their target market by taking advantage of the rich targeting Facebook Ads offer, such as: geographical location, gender, age group, orientation, education level, current relationship status, workplace and keywords. 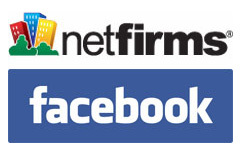 To obtain your free Facebook Ads credit you must be subscribed to one of Netfirms' hosting plans. To activate your Ads credit, please login to the control panel and click on the Facebook Ads link. * Promotional Ad Credits may only be redeemed only by a New Facebook Advertiser. The Promotional Ad Credits must be applied to such New Facebook Advertiser's account within 15 days of the creation of such account and is valid only for purchase of advertising through Facebook's Online Advertising System. The Promotional Ad Credit will expire on the Expiration Date. Advertisers will be charged for advertising that exceeds the Designated Amount. Advertisers will need to suspend their ads if they do not wish to receive additional charges beyond the Designated Amount. Placement of ads is subject to ad approval, valid registration and acceptance of the generally applicable Facebook Advertising Terms and Conditions. The Promotional Ad Credit is non-transferable and may not be sold or bartered. This offer may be revoked at any time for any reason by Facebook. Once a New Facebook Advertiser uses its Promotional Ad Credits in the Designated Amount, such advertiser may not use any additional Promotional Ad Credits. Promotional Ad Credits are valued in the Designated Amount which can be applied to the purchase of advertising through Facebook's Online Advertising System. Facebook is a registered trademark. $1.00 activation fee is charged separately. This offer is valid only for sign ups using the code or URL link received upon purchase of a Netfirms Plus, Advantage, Business or Enterprise hosting plans.